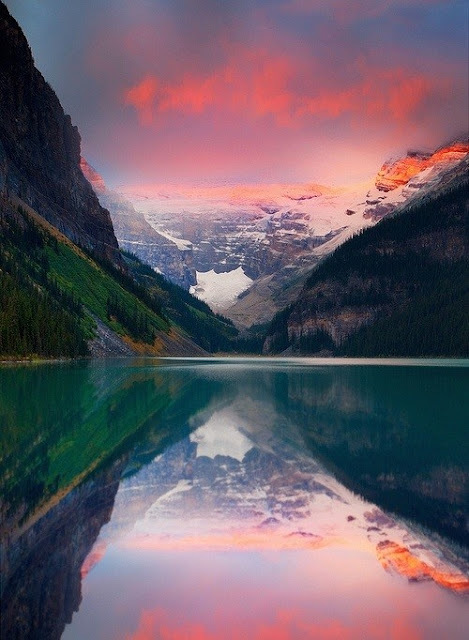 Reflected Sunset, Lake Louise, Canada. Moraine Lake is a glacially-fed lake in Banff National Park, 14 kilometers outside the Village of Lake Louise, Alberta, Canada. It is situated in the Valley of the Ten Peaks, at an elevation of approximately 6,183 feet. The lake has a surface area of .5 square kilometers.